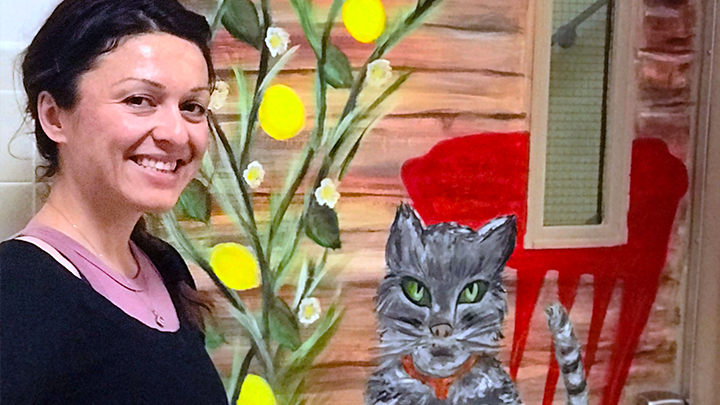 Registered nurse Jelena Marjanovic poses by a door she painted to resemble a fluffy grey cat on a vintage rocking chair in general medicine Unit 32 at Foothills Medical Centre in Calgary. Research indicates that such murals deter elopements, lower anxiety for patients and have a calming effect on staff. CALGARY — The tendency to wander off, or to see what’s on the other side of the nearest door, occurs frequently with mental health patients who have dementia or behavioural issues. For the price of a little paint and artistic inspiration, staff with general medicine Unit 32 at the Foothills Medical Centre have created scenic wall murals that not only deter exit-seeking by disguising doors, but promote a calming atmosphere to lessen anxiety and stress for patients. Research also suggests that units with colourful, joyful focal points not only make hospitals safer, but also promote healing and foster positive moods — making for a better patient experience as well as a more welcoming workplace for staff. 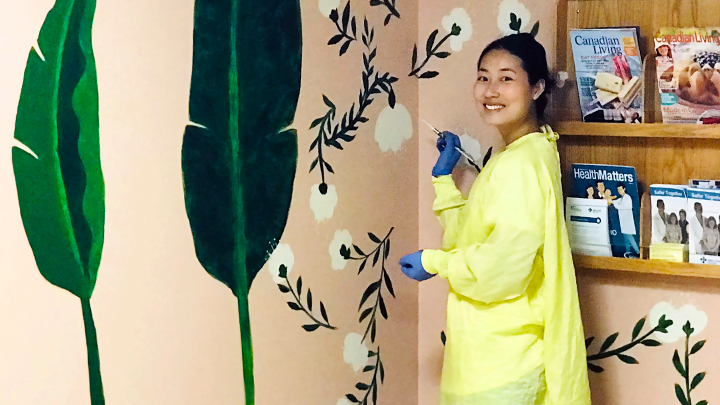 Her creations so far include a mural at the unit’s main entrance, with the word ‘welcome’ in 36 languages, ringed by colourful wildflowers and greenery. “It looks very inviting,” she adds. Lelia Park, a registered nurse with general medicine Unit 32 at Foothills Medical Centre, creates a double-wall mural. “I’ve had a lot of ‘thank-yous’ from patients, and people being appreciative,” she says. One door in the unit became her canvas for a fluffy grey cat on a vintage rocking chair under a lemon tree, while another now features a mountain vista at sunrise, reminiscent of the Banff wilderness. Raj Bhatti, the unit’s manager, has nothing but praise for his team’s artistic efforts. “The murals in the patient/family space and the unit entrance have made the space more inviting, comforting and positive,” he says. “The murals inside our unit and at the exit doors have helped with distracting dementia patients, which has led to a reduction in Code Yellows (missing person alerts), as well as creating a warm and calming atmosphere for staff. The paintings, done in acrylic, are seal-coated, wipe-able and very easy to keep clean.